HDB flats will also be revamped under the Main Upgrading Project (MUP) to feature grab-bars in the bathrooms and non-slip floor tiles. In a report released by the National Population and Talent Division in 2015, there are now 4.9 working adults supporting an elderly person as compared to a decade ago when the figure was 7.2 working adults to one elderly person aged 65 years and above. 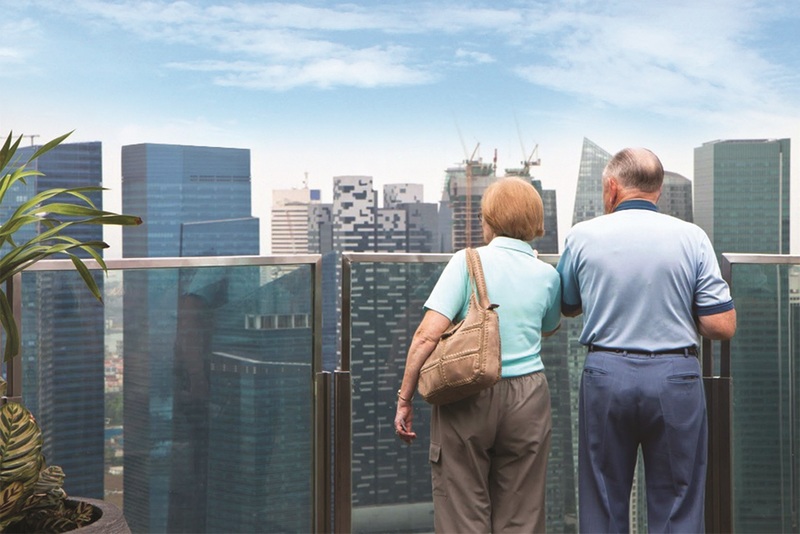 To care for the ageing population, the Singapore government has released a five-year action plan. This plan will help to ensure that the silver population is able to age-in-place and still lead an active life. One of the areas included in the plan is improvements to Singapore’s road and pedestrian infrastructure. 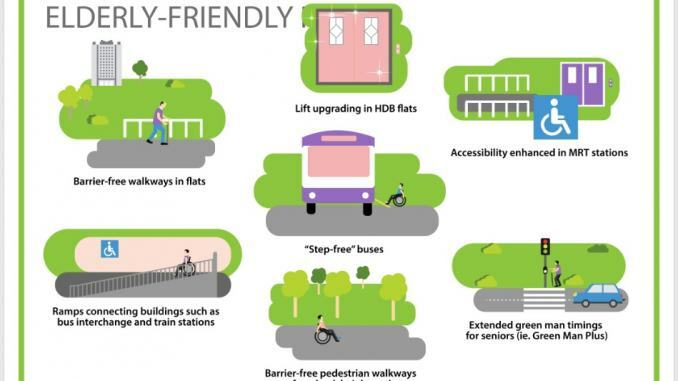 The government aims to make Singapore “an inclusive elder-friendly place” and the first step starts from the elders’ flats. Infrastructure in buildings, like walkways, has to be “barrier-free” for seniors. Walkways leading to flats and outdoor recreational infrastructure will be built with ramps to aid senior mobility. In addition, there has been lift upgrading in HDB flats since 2001 under the Lift Improvement and Facilities Enhancement (LIFE) to ensure that there is a lift serving every floor. The HDB Studio Apartments (SA) are built ready for seniors with numerous elder-friendly features, such as lever taps, non-slip tiles, support hand bars, emergency pull-cords as well as heat detectors, which will activate alarms. Next is the transportation system, which has to be senior-friendly. MRT (Mass Rapid Transit) stations are made more accessible and there is an increase in ‘step-free’ buses for ease of boarding. Another notable feature is the ‘Green Man Plus’ scheme by the Land & Transport Authority (LTA) to provide extended time for seniors to cross the road. Fifty such elder-friendly crossing areas are planned under the Silver Zone scheme by 2023. Infrastructure aside, the government also launched Healthcare 2020 in 2012, which encompasses three objectives: to provide Singaporeans with easier access to healthcare when required, to have good quality healthcare, and to ensure healthcare is affordable to the people. To make healthcare more easily accessible, more new nursing homes, Senior Care Centres (SCCs) and Senior Activity Centres (SACs) are developed within neighbourhoods to cater to the ageing population. For example, the SAC allows seniors to make friends at the centres and participate in social activities. For the SCCs, it provides more services such as day care and dementia day care, which allows families to have a peace of mind at work. The purpose of having these centres in the community is for the convenience of family members, as it makes it easier for them to visit their seniors, especially when they are enrolled in a nursing home. To ensure that the healthcare services are of good quality, more Community Health Centres and Family Medicine Clinics are introduced. Outpatient services and drugs are cheaper at public hospitals and polyclinics, and subsidies are available as well. The pioneer generation will also be provided with more help to make healthcare more affordable to them.